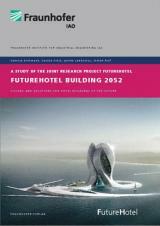 The study »FutureHotel Building 2052« presents sustainable possibilities for developing the hotel oft he future. Areas of innovation will be discussed from the planning process up to building automation, and a FutureHotel Building vision for the year 2052 will be presented. - FutureHotel vision for the year 2052 and subsequent implications for hotel projects in practice. The study provides investors and hoteliers, as well as their planners and consultants, concrete aids to ease decision-making processes and ensure long-term competitiveness. The individual strategy should always be adjusted to the specific situation and requirements of the respective hotel’s operations, as each hotel is unique and must find its own niche to be competitive.